Album: "Outlaws 'Til the End, Vol. 1"
Δελτίο τύπου: «The wait is over for new music! 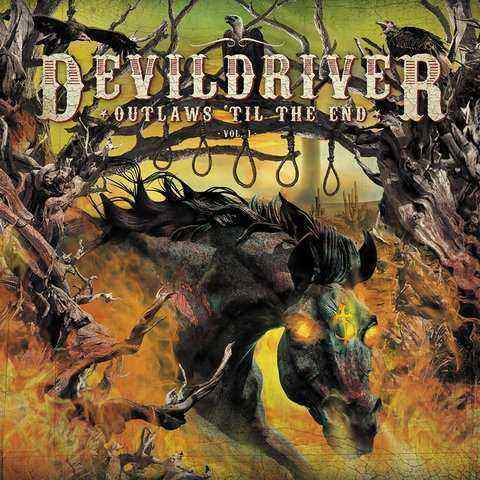 DevilDriver just dropped their full, haunting rendition of Hank3’s “Country Heroes”, featuring Hank3 himself on vocals. The album’s starter track kicks in with an ominous classic outlaw/country western intro, instantly careening into a heavy assault accented by Hank3’s Ozzy Osbourne-influenced vocal approach. Quickly veering towards full heavy metal with a grooving double bass foundation, the track travels into heavy-hitting signature DEVILDRIVER territory, wrapping up with a hair-raising, whiskey-soaked solo by guitarist Neal Tiemann.